Are you losing employees to your competitors or are resignations becoming a trend? Do your new hires come in with fewer skills than you really need? Does it take longer to fill one position in your company than most others? High turnover, skill gaps and slow time-to-fill a vacancy, when frequently associated with a particular role, could all indicate the same issue. Here’s how to figure out if compensation (i.e., base and bonus pay) is indeed the problem and how you can fix it. Some key jobs are simply more in demand than others and where there’s more demand there’s stiffer competition. If you face greater competition to catch these coveted hires, you may need to pay a higher rate to attract and retain people with the professional expertise you need. Highly trained key operational staff – positions that require specialized skills even if they’re not necessarily unique to your company or industry (e.g., accountants, payroll and HR managers). This doesn’t include easily trainable, entry-level roles (e.g. accounts payable clerks). Candidates for these positions have more options than most job seekers. Many companies need their skill sets, and many employers offer higher wages to win them over. Most companies are really good at hiring employees for their bread-and-butter positions. Consulting firms can easily hire consultants; manufacturing companies can easily hire machine operators. That’s because businesses have a good read on what makes for fair, competitive pay for their core, industry-specific roles. But when it’s time to hire for one of the positions mentioned earlier, it may be much tougher to settle on the right pay. For example, say you run a doctor’s office. When you need to hire doctors and nurses, you are competing with local medical practices of about the same size, so the market rate for their salaries is pretty straightforward. But when it’s time to hire an IT manager, you likely don’t have any in-house expertise on an appropriate salary range. In cases like these, it’s worthwhile to hire a recruiting firm to conduct a compensation analysis for you if you’re having trouble hiring or keeping people in a particular position over time. Spending the money to benchmark a position will help you judge whether you’re offering an appropriate salary or if the root cause is elsewhere. Although you’ll pay upfront for the analysis, it may be cheaper in the long run than continuing to waste resources on employees who don’t fit your needs or who don’t stay. Be open to changing your mindset and to hearing what a compensation benchmark may tell you about the fair market pay for a position in your area. Sometimes you’ll find that you have to up the pay for a position to speed up hiring, reduce turnover or attract employees with the appropriate set of skills. Other times, you may be able to make do with a different skillset by spending more time on training and development after hiring a less experienced employee. A well-developed HR strategy can dramatically improve your recruiting and retention. 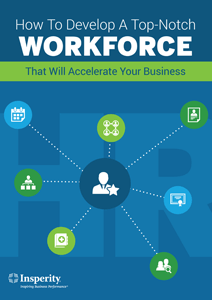 Learn more in our free e-book, How to Develop a Top-notch Workforce That Will Accelerate Your Business. Compensation is typically taboo…A few years back, I brought up pay during a ‘Start/Stop/Keep Doing Lunch’ hosted by HR. We were told to discuss what we wanted to see happen in the company. The second I brought up salary, HR blushed and pivoted the convo away from my point. Intelligently handling an uncomfortable conversations is key for not only morale and culture but also for the employee to know their employer respects their opinion and truly wants to hear them out. As mentioned in the article, it’s integral to do your homework on salary ranges and benefit plans to ensure your talent feels valued and respected. “A well-developed HR strategy can dramatically improve” your business as a whole.